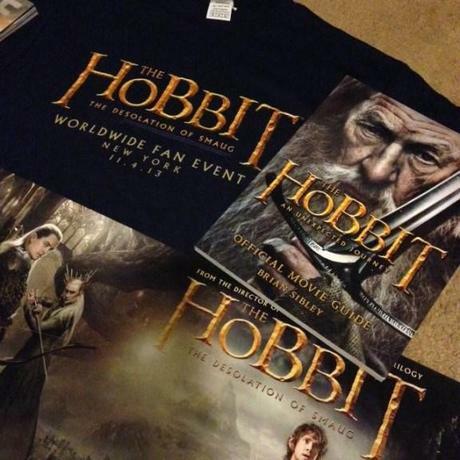 On Monday November 4th Warner Brothers held a live fan event for The Hobbit: The Desolation of Smaug that was unlike any fan experience that we’ve seen before. It was a live coordinated event done through the 4 host cities of New York, Los Angeles, London and Wellington with celebrity guests from the films making an appearance at all venues. 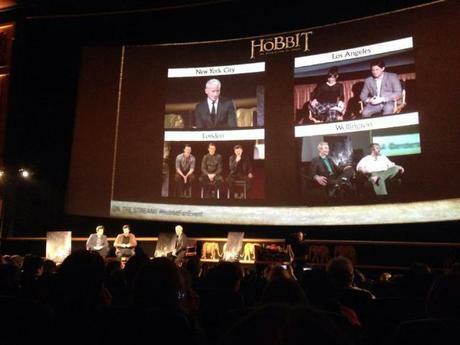 The first part of the session was also broadcast live throughout the world and into over two dozen cinemas worldwide so that the fans who weren’t in attendance could get to enjoy it as well. Fortunately for me I was one of the very few and very lucky fans to be able to get tickets to this event and being that The Lord of the Rings is my life I made sure I was off of work and there over 4 hours early. What follows is a summary and breakdown of the entire event from my point of view as well as links to some of the new footage and music that has been released. First things first I have to give a humongous shout-out to Peter Jackson and Warner Brothers for handling this event with care and kindness while giving something truly special to the fans. I said it before and I’ll say it again, there just isn’t anyone else in the world like Peter Jackson. No other director can come close to what he does for his fans in almost any aspect. Between the countless extended editions, special features, production diaries and glimpses into the moviemaking process he gives us an inside view to a world that few ever get to experience. 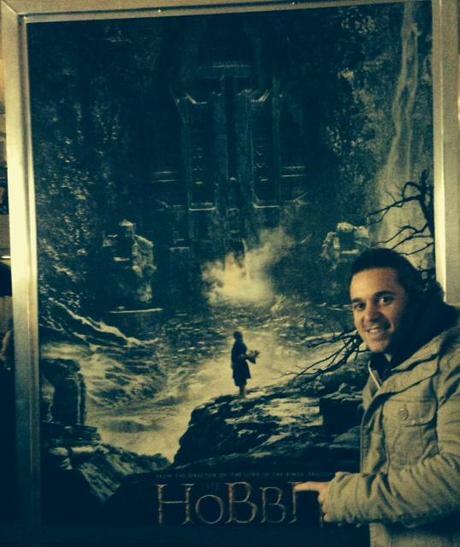 The guy just cares about the die-hard Tolkien fanbase and will constantly go above and beyond at any moment to give them something unique. As for the event I got to the theater about 4 hours before it took place and there were TV crews and streaming sites ready to go, as well as about 100 people already in line. As soon as we got our tickets scanned we were given wristbands and had to sign a waiver stating that we wouldn’t film any of the event on our cameras or smartphones. They let us actually turn this voucher into a t-shirt for the event as soon as we got into the theater and that was just the beginning of the free giveaways. Warner Brothers also provided endless popcorn, soda and other refreshments for the fans of the event which was genuinely nice and much more than I was anticipating. Our view of the screening! 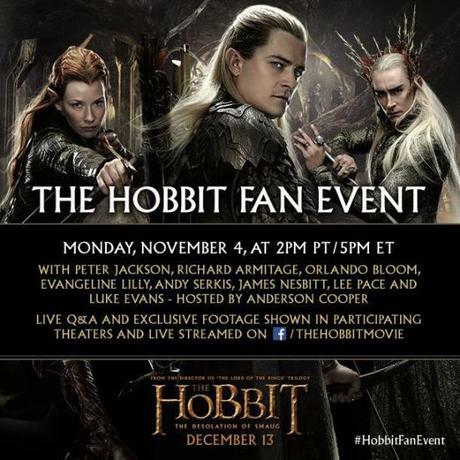 The event in New York was hosted by Anderson Cooper (who was hilarious) with Orlando Bloom (Legolas) and Richard Armitage (Thorin) as the guests. Some highlights from the banter included Bloom calling Legolas “Leggy” and saying that he was proud of doing his own stunts while being able to fit into his old costume. At one point they showed a clip of Legolas flying through the air and split landing on top of a staircase while he fired an arrow and Orlando Bloom fist pumped and shouted “YEAHHH THAT WAS ME!”. Armitage on the other hand was very quiet, calm and stoic just like his character and that’s pretty much what I expected. He said he was a Tolkien purist and his favorite parts of the movies were the parts and lines that are lifted directly from the literature (now that’s my dude). After the live streaming of the event ended it was just the people in the audience and we finally got to the rare stuff. The video opened up with Peter Jackson giving a speech about how cell phones needed to be shut off because we were getting an extremely rare and exclusive treat. 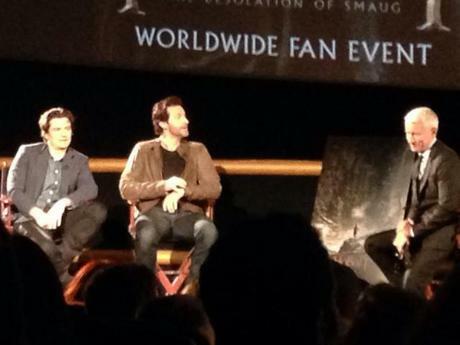 It turned out that we were able to view a ton of clips from The Desolation of Smaug while also being the first fans in the world to ever get a glimpse! He said that Warner Brothers wanted him to show 5-8 minutes of footage but he went a little overboard and gave us TWENTY! As you can imagine it was the most giddy and epic experience of all-time. A 4 minute sequence of Bilbo popping his head out of Mirkwood forest and fighting the spiders in that iconic moment from the novel. We got an extended look and a cool glimpse into how the spiders actually act which was really exciting. I was wondering how they were going to be able to have the spiders talk because it didn’t fit the tone of the movie but they had a really cool way of presenting that aspect. Basically whenever Bilbo puts on the ring to remain invisible and help the imprisoned dwarves he can hear them speaking in English and that’s where we got all of the lines from the novel. I must say it was a pretty brilliant way of doing it and I couldn’t imagine making that scene any better in terms of a strong adaptation. We also got an extended look at the scene where Tauriel, Legolas and Thranduil interrogate an orc scout who warns them that Sauron is coming to destroy and scorch the Earth. Tauriel attempts to kill him but Thranduil intervenes and takes care of the guy himself with a pretty epic beheading. Lee Pace straight up owned that sequence and looks to be one of the new highlights in the movie when it comes to the extended cast. The orc was done in ACTUAL MAKEUP which was absolutely phenomenal to see and an amazing break from the CGI heavy orcs we saw in An Unexpected Journey. We got a third sequence of Bilbo freeing the dwarves from captivity (I’ll avoid spoilers here) and giving us the introductory scene to the famous barrel escape from the book. 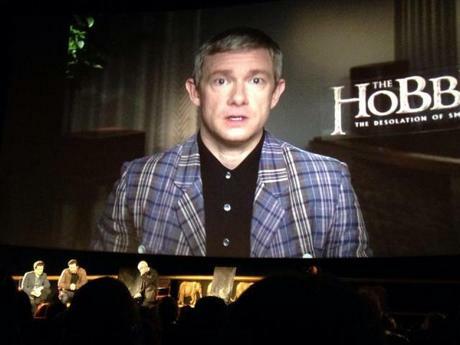 The banter was fantastic between the company as Martin Freeman had a lot more creative freedom which he used to deploy a bunch of comedic elements. 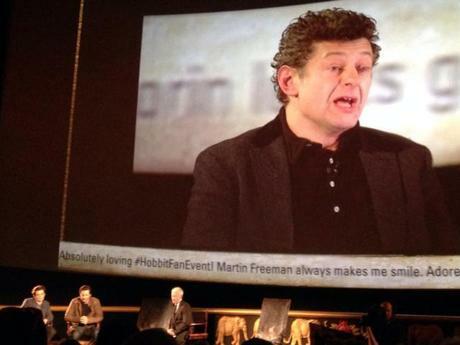 From the clips I saw I noticed that this was a recurring pattern in the sense that there is a strong focus on Freeman’s Bilbo (as there should be) and a perfect mix of comedy in the dramatic, tense moments. We saw the full sequence of Bard escorting the dwarves to Laketown which was pretty cool to witness in all of its freestanding glory (we even saw how they managed to sneak them in which again I won’t spoil). However the last shot they gave us was a 6 minute long scene of Bilbo entering Smaug’s lair in Erebor and looking for the Arkenstone (on instructions from Balin). This scene was again dominated by the comedic timing of Martin Freeman as he looked through gold and diamonds and tried to find exactly what he was looking for (they played on the fact that it was like searching for a needle in a haystack). When he got to the bottom of the mountain of gold he accidentally knocked over a pile of coins which revealed Smaug’s eye and gave us the very introduction to the epic encounter between the two of them. I was honestly shocked by the amount of footage they gave us and it was probably the coolest amount of the movie I could ask for without getting into the core of the story. For those interested Warner Brothers simultaneously released a new “Sneak Peek” trailer that has a couple of small glimpses at the sequences we saw (while also being a phenomenal trailer). Watch below! Overall it was an absolutely magical and well orchestrated event that was a truly special treat for the fans. After it was over they gave us free t-shirts, posters of the banner that was released last week and a couple of lucky people (I managed to get one) were given the movie guide to An Unexpected Journey. In all honestly it was probably the best experience of my entire life since I never in my wildest dreams thought I would be able to get this close to members of the film and Peter Jackson himself. I mean, I still can’t believe it actually happened and I’m still pinching myself as I write up this summary two days later so I really hope you got a glimpse into what I was able to see; and don’t forget to check out The Hobbit: The Desolation of Smaug in theaters December 13th!